Only 2 of 16 approved sunscreens are deemed safe and effective! This is a big deal! After over 40 years of people slathering on poisonous chemical sunscreens approved by the Food and Drug Administration (“FDA”), the FDA decided that actually 12 out of 16 approved active sunscreen ingredients do not have enough scientific data to determine whether they are harmful for humans, and two of them have been officially declared unsafe. The FDA found that only 2, zinc oxide and titanium dioxide, were deemed safe and effective based on available data. The February 21, 2019 FDA announcement of the proposed jaw-dropping changes to sunscreen safety could revamp the whole sunscreen industry. No joke. Seriously, though, kudos to the FDA for taking the long overdue action. As the old saying goes, better late, than never! In the proposed regulations, the FDA stated that growing evidence shows that the skin absorbs sunscreen chemicals more than they thought and “thus may raise previously unevaluated safety concerns, including the potential for reproductive, developmental, or carcinogenic effects.” In other words, they did not realize that the chemicals easily enter the blood, breast milk, amniotic fluid, and can cause cancer, give you a big estrogen-like dose of hormone disruptors, lower testosterone levels, and have adverse developmental effects on children. A prohibition on insect repellants in sunscreen products. 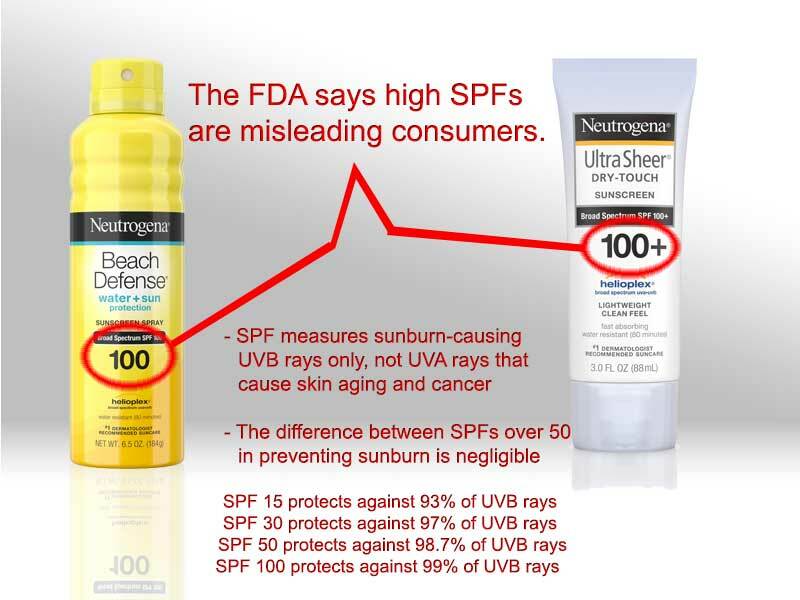 “There are many sunscreens on the market using the 12 ingredients that we’re requesting additional data on… We'll just have to wait and see to determine where the safety data are for these ingredients going forward,” said Theresa Michele, director of the FDA’s division of nonprescription drug products during a media briefing. The FDA is seeking public comment on the proposed rule and will consider comments provided as the agency works towards developing a final rule. No doubt the billion-dollar chemical sunscreen industry with their deep pockets will come up with numerous scientific data showing how “safe” and “effective” these chemical ingredients really are. Would they really submit data against their interest and profits? We hope this is not just a set up for big industry to “prove” themselves in light of all the questions raised by the sunscreen laws passed in Hawaii, Key West, and elsewhere. Will the FDA weigh the data of non-profits and non-industry scientists with fewer resources against industry-paid data equally? We shall see. OTC sunscreen products will continue to be available on the market for consumer use, while the rulemaking process proceeds. The FDA reiterated that sunscreens are only one element of a skin-cancer prevention strategy, including wearing protective clothing, wearing sunglasses and hats, and seeking shade whenever possible during periods of peak sunlight. In the meantime, don’t wait for big industry to submit data against themselves, reach for Kōkua Sun Care, a known safe and effective sunscreen with non-nano zinc oxide with the best rating (i.e., a “1”) by independent reviewers of the non-profit EWG (ewg.org), meets all current requirements of all the sunscreen laws around the world, and by the way, already meets the proposed FDA regulations.